Majorca or Mallorca, which ever way you pronounce it, this is one destination that is bursting at its seams with vibrancy. You cannot but help being swept up in the sheer enthusiasm spilling from the island. 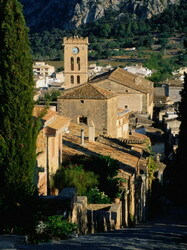 The largest of the three islands, Majorca's popularity never wanes. 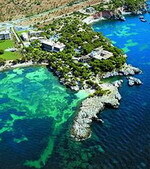 Being in the Mediterranean Sea, Majorca enjoys perfect weather and is a favourite among the jetsetters of the world. Here, you decide what kind of vacation you are after, be it lazing around the endless beaches, partying hard at the many beach parties held around the island or even normal holiday activities like shopping and site seeing. Adrenalin seekers are not disappointed either as Majorca offers an endless array of activities such as water sports like windsurfing, jet skiing, sailing and scuba diving. If water sports are not your thing then try hiking around the olive groves and scenic gorges. There rustic villages, migratory birds and secluded beaches to be discovered. You could also hire a bicycle and enjoy the views the island has on offer. Of course Majorca has an abundance of festivals fiestas to be experienced, where a traveller can gain an authentic look into the island's culture. It is also the golf enthusiast's heaven and golfing holidays are very popular in Majorca. Enjoying the Spanish cuisine is a must for anyone on holiday there. In a country where olive oil is used generously you are guaranteed a tasty meal; indulge in some seafood paella, spicy chorizo, and spicy sobrasada for a culinary journey with a difference. Not to be forgotten is the amazing local wine, a bottle of which will help make any meal a feast! Throughout the island you will find restaurants, bars and cafes along with take-aways around the island making it easy to experience Majorcan food. Die hard party fans are guaranteed to find a club or bar to suit their tastes. There are trendy clubs in Majorca with night long DJ music and entertainment. Majorca clubs are very popular with the young looking for a unique stag or hen night. Words are not enough to describe the type of vacation you will enjoy in Majorca. It is something that has to be experienced to be believed. So make Majorca your next holiday destination and find out what all the hype is about! The Balearic island of Majorca is Spain's largest land-mass not connected to the mainland, with a population of almost 800,000. While officially known as Palma, its capital is also dubbed Palma de Mallorca or Ciutat de Mallorca, acting as the capital of the whole of the Balearics. Palma lies in the Bay of Palma on the south coast and is home to almost half of the island's entire population. Whereas Majorca offers some of the world's most impressive beaches and not to mention good deal of favorable weather, the capital is perhaps better-known for what is on offer in its historic quarter. Made up of Renaissance mansions and Baroque churches, the area is an ideal starting point for tourists wishing to take in the island's history and culture. Part of the reason the destination is of such historical interest is the sheer variety of its influences. It was first founded as a Roman camp. There is also evidence of Vandal influence from East Germany and Byzantine control (mosaics are dotted around the city), before the arrival of the Moors. The Spanish took control over 300 years later when King Jaime I of Aragon laid siege to the island. Easy to explore without the aid of transport, Palma's top attractions are now contained within the city walls. The much visited Almudaina Palace is the royal summer residence, whereas Bellver Castle dates from the 14th century and has a unique circular design. Possibly the most popular attraction though is Palma's Gothic cathedral, which took more than 500 years to build and forms the centre-point of the city's historic quarter. The Cathedral of Palma, also known as La Seu, was built on the site of an Arab mosque, constructed from gold limestone from the local quarries of Santanyi. And although it was begun by King James I of Aragon in 1229, it wasn't until 1601 that it was finally completed. It has been reported that in 1229, the fleet of Jaime I was affected by a large storm while attempting to recapture Majorca. The king is said to have vowed to the Virgin Mary that he would erect a church in her honour if he made it through the storm safely; he immediately undertook the project when he landed safely on dry land. Indeed, with so much to see and do, it is good to know that when looking for flights to Palma, visitors can be sure they will arrive at the heart of Majorca's historical significance. With the island's many attractions being so accessible, the city of Palma is an ideal place from which to explore; although, with attractions such as the Cathedral of Palma on their doorstep, many visitors may decide to stay put. About the Author - Isla Campbell writes for a digital marketing agency. This article has been commissioned by a client of said agency. This article is not designed to promote, but should be considered professional content. The AC Ciutat De Palma is a smart, modern hotel offering 85 guestrooms and situated next to Plaza Puente and just 50 metres from the promenade and beach. The hotel restaurant offers a menu of simple Mediterranean dishes in a relaxed, informal setting; both guests and visitors can dine inside in air-conditioned comfort, or outside on the more intimate terrace setting. Residents can also leaf through complimentary newspapers whilst taking advantage of the hotel's free coffee shop. Visitors venturing out the hotel can spend their time exploring the old gothic city of Palma de Mallorca, visiting museums and examining ancient artifacts that date back to Turkish occupation. Situated in a pleasant, residential area of Palma, the Hotel Hesperia Ciutat de Mallorca offers every facility for your business trips or simply for your well-deserved breaks. The hotel has beautifully landscaped gardens, a swimming pool, a sauna and a gymnasium as well as meeting and convention rooms. This small and friendly hotel offers genuine hospitality and fine facilities which meet and exceed the expectations of both business and leisure travelers. Whatever brings you to the Hesperia Ciutat de Mallorca, you'll be comfortable and content in this pleasant, four-star property. There's a commercial center only half a kilometer from the hotel. Bellver Castle is one kilometer away. The hotel is also near the harbor, and the famous cathedral is only 3.5 kilometers away. The Hotel Continental is a townhouse hotel characterised by old-world grandeur. It is located in Palma city centre within one kilometre of the picturesque old town, the city's busy nightlife and the seafront promenade. Palma de Mallorca Airport (PMI) is 9 kilometres away, an approximate driving time of 15 minutes. The hotel is wirelessly linked to the Internet throughout, and there is also a gym, a Turkish bath, a sauna and a spa tub. The bar offers a range of drinks, and the hotel also offers a conference room and complimentary onsite parking. A stained-glass ceiling throws individual spectrums onto authentic artworks and colonial-style wicker furniture in the restaurant at Hotel Continental, which specialises in international and locally derived Balearic dishes. Convent de la Missio is located in Palma, Spain, 500 metres from the Placa d'Espanya railway station, 1.5 kilometres from the Museum of Spanish Contemporary Art, two kilometres from Museum es Baluard, and three kilometres from Palma Cathedral. 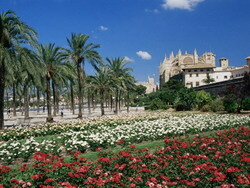 Palma de Mallorca Airport is 10 kilometres from the hotel. This stylish boutique hotel is a former 17th-century monastery, and houses its own art gallery exhibiting photography, paintings, pottery, and sculpture. Convent de la Missio serves a range of creative dishes, featuring local produce and various wines, in the Refectori Restaurant. A complimentary buffet breakfast is served every morning.The hotel also features a wine cellar, massage services, a sauna, and a spa tub. 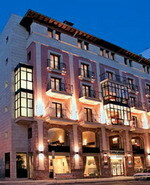 The Hotel Dalt Murada is a four star hotel located in a restored nobleman's home in the city center of Palma. 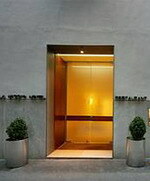 The hotel is located between the cathedral and the town hall, near the best shops and boutiques of the city. As well there are many good restaurants near by. From the hotel the guest can walk to the stores, restaurants and visit the most relevant monuments of the city. 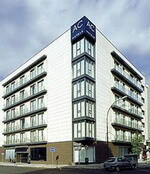 Although the hotel is located in the city center, the hotel is very quiet. The highlight of the hotel is the courtyard since it is extremely peaceful and sunny. Most of the rooms have courtyard views. 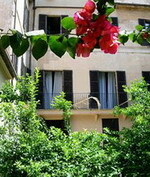 The hotel has just eight rooms - three doubles and five suites, one of which has wonderful views and a private terrace. All rooms harmoniously blend tradition and comfort. Every room is either named after a Mallorcan painter or some other aspect of the island. 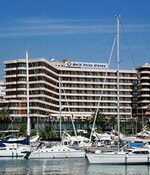 Set on the promenade, the hotel has beautiful panoramic views of the Bay of Palma. It is only 12 kilometres from the international airport and offers easy access to the city centre. All rooms have terraces. Their design is modern and their size standard. They are all equipped with mini bar, interactive satellite TV, Canal plus, 2 direct dial telephones, fax and modem connections, safe, internet and piped music. 24 h. room service available. A modern air conditioned restaurant serves cold and hot buffet for breakfast and buffet service with waiter service for dinner. The public areas are spacious and the hotel offers outdoor barbecues for summer, piano music, terrace bar, indoor pool, health centre and a jewellers. Set alongside Mallorcan palaces including the summer home of the King of Spain, this palatial beachfront hotel boasts sweeping views of the bay of Palma, five kilometres from the island's capital, Palma. Palma de Mallorca Airport (PMI) is 15 kilometres away. All of the hotel terraces offer panoramic views of the Bay of Palma and the palm-lined white-sand beach of Cala Mayor, immediately in front of the hotel. On the third floor, a triangular outdoor swimming pool has been converted into a chill-out area with a bar, ambient music and soft seating with large cushions. At beach level the spa area includes massage rooms, a hot tub, and hydromassage pool. At ground level, sun loungers are set out in a small lawned area beneath tall palm trees, facing the beach. The Nixe Palace has three restaurants serving Mediterranean dishes and seafood specialities. There is also a poolside bar and lobby bar. Palma Bay - Popular tourist area in and around Palma de Mallorca, the capital of Mallorca. 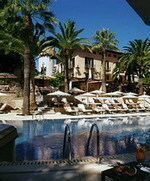 Nearby Palma Nova is a popular and friendly resort, popular with families. its curving sand and shingle beaches are kept clean and safe, with lots of watersports. Situated on a beautiful cove on the western side of the Bay of Palma de Majorca, the Barcelo Albatros is ideal for golf enthusiasts and beach lovers, and affords wonderful views of the bay from the peaceful district of Illetas, just a few minutes from the city. Its convenient location close to the capital Palma de Majorca, offer the comfort of the accommodation and the personal touch of service, which makes this an ideal spot for business trips in Majorca. Other services include a piano bar, a cafeteria, a poolside snack bar, 1 outdoor pool for adults and another for children, a solarium with towel and lounge chair service, a small private beach, jacuzzi, sauna, massage service, hair dresser and a gift shop. A friendly staff warmly welcomes you. The Castillo Hotel Son Vida is a 13th-centrury medieval castle set in extensive gardens and offers wonderful views over the bay; it is 1 kilometre from the Son Vida Golf Course and 10 kilometres from the city centre. The hotel offers two dining options: Restaurant Es Vi where international cuisine is served in an elegant, bodega-style setting, with views to the outdoor pool and bay, and ceiling-high glass doors which reveal 800 wines from the best appellations, and Restaurant Es Castell which serves Mediterranean cuisine and features a glass façade which affords an impressive view over Palma and the sea. The championship 18-hole golf course houses the Arabella Golf & Spa Resort Mallorca Golf Academy, and there is an intimate piano bar featuring live music. 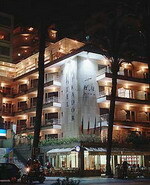 Mirador Hotel stands in Palma de Mallorca, Spain, the capital city located on the south coast of the Balearic Islands. 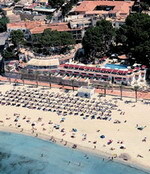 The hotel stands within view of the Bay of Palma. The Gothic Quarter and Palacio de la Almudaina, housing the National Museum, stand one kilometer from Mirador hotel. Moreover, the hotel offers a reading room and a gallery of paintings. Mirador Hotel also features an indoor pool. On the fifth floor of the hotel, the main Restaurant serves Mediterranean cuisine with panoramic views of the bay. The restaurant also provides fresh air dining on the terrace. Moreover, Mirador hotel presents a daily complimentary breakfast buffet, served in the dining room or delivered to private guest rooms. Situated one kilometre from Portals Marina, the H10 Punta Negra Resort is located right on the seafront of a peninsular off the Costa d'en Blanes, with direct access to two sandy bays. The resort is set in its own large gardens and guests enjoy a choice of three restaurants, all with views of the beach, gardens or pool. Leisure facilities feature two outdoor pools, children's pool, indoor heated pool, two saunas, Turkish baths, beauty salon and a treatment parlor. For sporting guests there are five golf courses in the vicinity, a tennis club one kilometre away with seven clay courts, and a gymnasium. 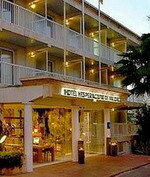 The hotel is approximately 22 kilometres, a twenty-minute drive, from Palma de Mallorca airport. The Hotel Hesperia Villamil is a modern hotel with a white façade, set amid lush gardens and adjacent to Peguera Beach, 20 kilometers from Palma. The hotel has two restaurants: At Restaurante Dragonera guests can enjoy a wide range of International cuisine with an extensive wine list and views over the Mediterranean. Restaurante La Terrasse offers a variety of Mediterranean dishes and an extensive wine list. This terrace restaurant looks out to the sea front. The hotel also has a bar, Bar Andratx, where guests can relax with a snack or cocktail against a backdrop of dramatic vaulted arches carved out of stone and stone pillars with floral moldings. The bar has an outside area with a blue tiled terrace from where piano music is sometimes played.